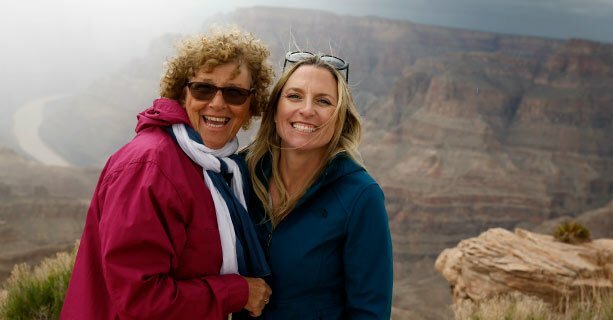 This Grand Canyon Airplane tour takes passengers from Las Vegas to the West Rim, home of the Hualapai Native American Tribe. 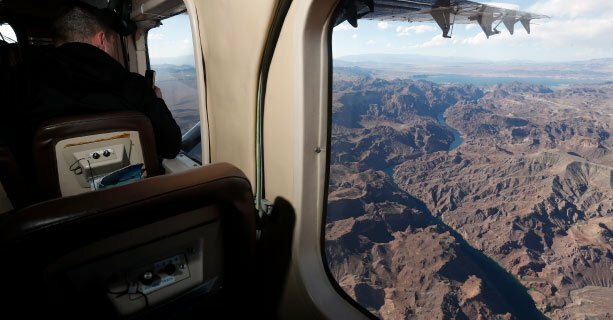 This 35-minute flight to the Grand Canyon includes incredible aerial views of Lake Mead, Hoover Dam, and the Colorado River. The West Rim offers a complimentary hop-on/hop-off shuttle service for easy travel between various points of interest. 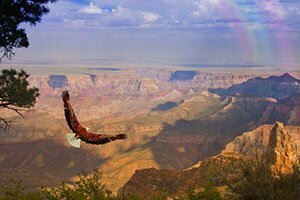 Both Eagle Point and Guano Point allow visitors to marvel at the brilliant colors adorning the two-billion-year-old walls of the canyon. Eagle Point is home to the Skywalk Bridge as well as a Native American cultural village housing exhibits and various ancient dwellings of many area tribes. The tall bluff at Guano Point offers incredible 360-degree views of the canyon walls, perfect for capturing a variety of photos. 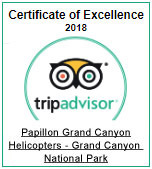 Guests can also enjoy a meal at their convenience during their visit at the Grand Canyon. 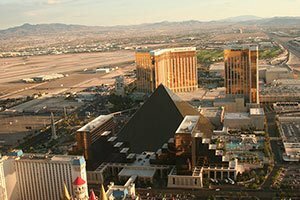 Return to your airplane for an equally scenic flight back to Las Vegas, where you will be transported back to your hotel. Upon arrival, check in at our private air tour terminal. 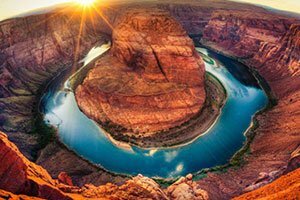 See views of Hoover Dam, Lake Mead, and the Colorado River. 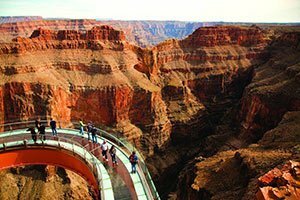 Arrive at Grand Canyon West and board a shuttle to multiple stops along the rim. 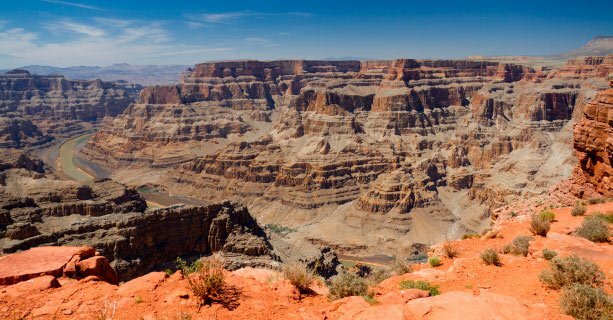 The time spent in the Grand Canyon is approximately 4 hours. 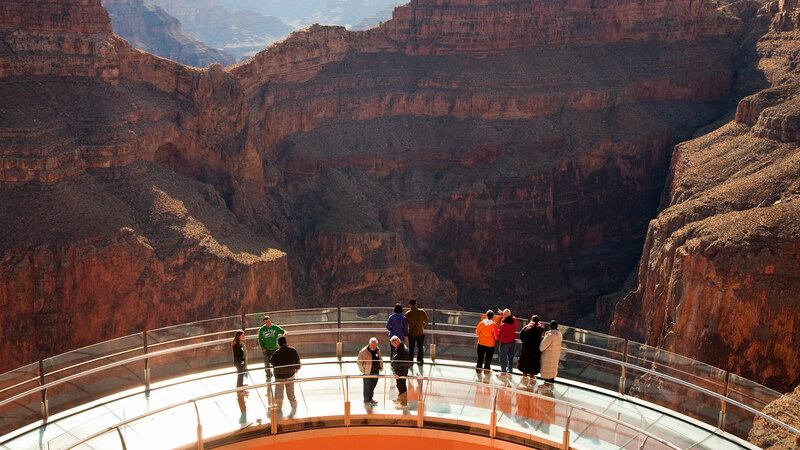 Walk around the Skywalk Glass Bridge and enjoy amazing views of the canyon floor. 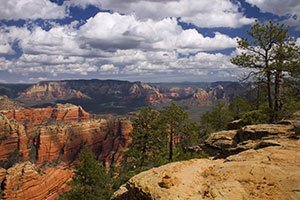 This location offers incredible 360-degree views of the canyon from various stops along a trail. 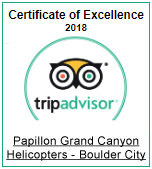 A meal is provided and can be enjoyed at your convenience during your Grand Canyon visit. Arrive at the terminal and check in at the transportation desk for return transfers to your hotel. The Skywalk Bridge is fully accessible, including ramps and a paved walkway. Wheelchairs are permitted atop the glass bridge. Add A Helicopter & Boat!